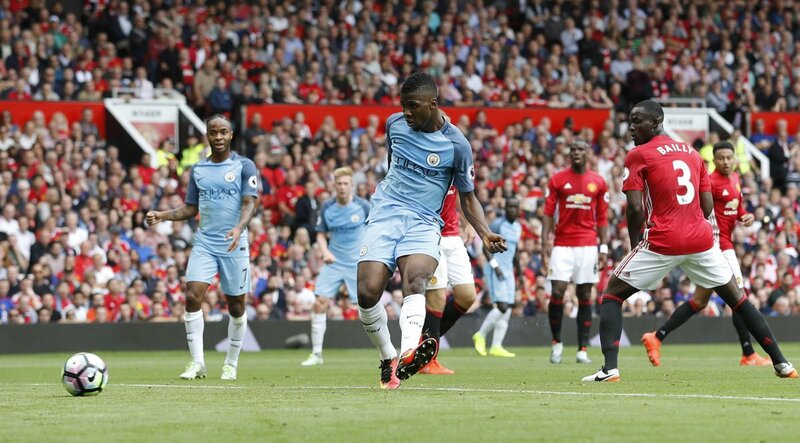 Goals from Kevin de Bruyne and Kelechi Iheanacho were enough to give Pep Guardiola's Manchester City a deserved triumph in the first Manchester Derby of the season, as Zlatan Ibrahimovic's reply wasn't enough to help United in a memorable contest. In a game which was billed as a heavyweight clash between two polarising managers as well as the star-studded players on show, an electric atmosphere at Old Trafford promised plenty of fireworks ahead of the festivities. A breathtaking start in which neither side was able to settle on the ball soon quietened down to let the football do the talking. 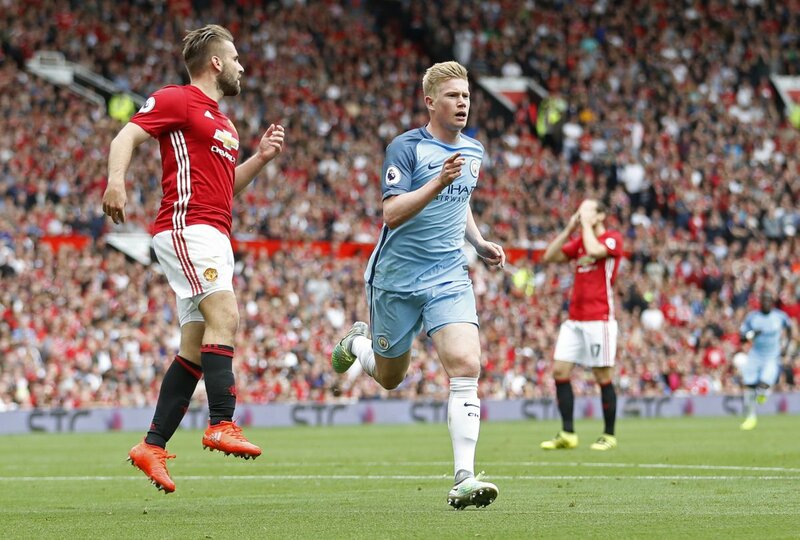 Manchester City enjoyed plenty of possession early on, as Jose Mourinho's gladiators resisted the oppression of De Bruyne and Nolito. It was world record signing Paul Pogba who threatened with the first sighter on goal from 35 yards, as a driven effort flew just over the bar from the Frenchman.A minute later, it was the blue half of Manchester in delirium. United defender Daley Blind failed to deal with a hopeful, thrusted hoof upfield and Kevin De Bruyne raced forward to latch onto the loose ball, before coolly slotting past the onrushing De Gea. Guardiola's pressing plan was working effectively, as countless red shirts continued to give away cheap possession in the first half, ultimately resulting in City's lead being doubled and consolidated. De Bruyne was again at the heart of the move, skipping past Blind before snapping a shot against the far post. Blind had been left bamboozled by the Belgian's footwork and made a major error in playing Kelechi Iheanacho onside from his deep positioning; The 19-year-old forward accepted the gift of a goal from the rebound as The Theatre of Dreams was left stunned and dazed. A cracking opening half continued to go from strength to strength, as United struck back with a goal of their own in the 42nd minute, setting up a tantalising second half. A long free kick was spilled by debutant goalkeeper Claudio Bravo on the penalty spot, and Zlatan Ibrahimovic made sure to punish the fatal error with a lashed volley into the unguarded net. Game on. Mourinho rung the changes at the interval, hauling off both Jesse Lingard and Henrikh Mkhitaryan for Ander Herrera and Marcus Rashford. The duo had faltered as the first 45 minutes wore on and looked out of place in a thrilling Derby encounter. Bravo's horror showing in his first English game didn't show any signs of getting better as the Chilean turned inside Herrera to brush off pressure before having to lunge into Wayne Rooney to reach the ball from his initial touch. For someone whose big selling point was his work with the ball at his feet, Claudio Bravo had been a bag of nerves spreading nothing but uncertainty through Manchester City's defence. With twenty minutes to go and City having to settle for a counter-attack solution to United's pressure, Marcus Rashford displayed his undoubtedly sizeable talent with a scurry down the left flank to leave Sagna and Stones in his wake before lashing a shot past Bravo to equalise. Or so it seemed. Otamendi had smartly left Ibrahimovic in an offside position just in front of Bravo, and Rashford's effort deflected off the Swede's shin into the net. A false alarm and another warning sign for the visitors that the three points are never wrapped up early against Manchester United at Old Trafford. David de Gea was then called into action for a quickfire double-save as first Fernandinho with a low volley, then Otamendi from the rebound threatened to seal the win from a set piece. There was nothing the Spaniard could do about City's next attack though, as Kevin De Bruyne swarmed forward before blasting past the 'keeper onto the post, and as the ball rolled across the line and eventually to safety, Red Devils will have had their hearts in their mouth. A late flurry of attacks from United failed to open up City, even with the unstability of Claudio Bravo's jangling nerves in their favour. Pep had beaten Jose, and for now, Manchester is blue.